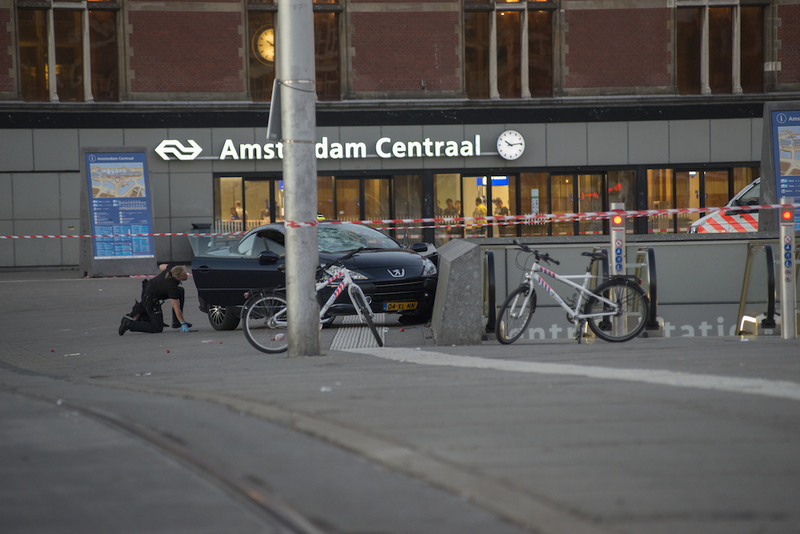 Eight people were injured in an incident involving a car in front of Amsterdam’s main railway station on Saturday night but police say they do not think the action was deliberate. The black Peugot 307 was apparently parked in a spot where waiting is not allowed, local media said. According to the Parool newspaper, police spoke to the driver and asked to see his licence which he showed them. The man then drove off, hitting several people, and ploughed into a low wall next to an entrance to the metro. A police spokesman said it appeared that the driver may have been taken ill. ‘Of course we are carrying out further inquiries to rule out anything else,’ the spokesman told reporters. Two people are said to be seriously injured and have been taken to hospital. The others were treated at the scene. Eyewitness John Berg said on Twitter the incident was ‘terrifying’. The main area in front of the station was sealed off for a time but train services were not affected and passengers were still able to use the side doors, Dutch railway company NS said. Tram services which terminate at the station’s main entrance were rerouted. By 11pm, the car had been towed away and the station square re-opened to the public.